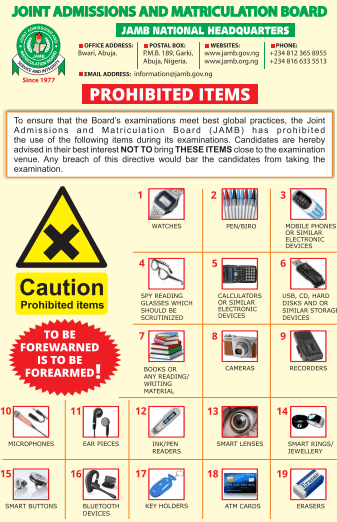 The Joint Admissions and Matriculation Board (JAMB) has released the list of Prohibited items in both mock and the main examination hall. In case of medicated eye glasses, the examination officials are allowed to scrutinise it and where convinced that such item may compromise the sanctity of the examination, the examination official would have to confiscate it. Whereby an examination official (board staff or ad hoc staff) or any authorised person is found with any of these prohibited items in the examination hall, such compromising action would be treated as a deliberate act of examination sabotage and necessary sanction will be applied. These are part of the steps being taken by the JAMB Monitoring Group, a Civil Society Groups inaugurated by the JAMB Registrar, Prof. Is-haq Oloyede, in checkmating examination malpractice. Last year, the groups were reputed to have assisted in giving information from the field and transmitted several challenges, as applicable, to JAMB officials which helped in curbing the high rate of examination malpractices in 2017.